I take dance classes with a great group of ladies. We’ve been taking jazz at our local dance studio for over 7 years now. Jazz is sort of like a contemporary form of ballet if you were wondering. I never know how to explain it, and the hubby thinks I’m a poser when I can’t tell him why a routine on So You Think You Can Dance is jazz versus contemporary versus modern versus whatever other forms there are out there. All I know is I enjoy it. I REALLY enjoy this street jazz class I take as well every once in while. It makes me feel like I’m dancing in a music video (one of my secret dreams) as long as I am actually remembering the choreography and not just standing there looking like a fool. 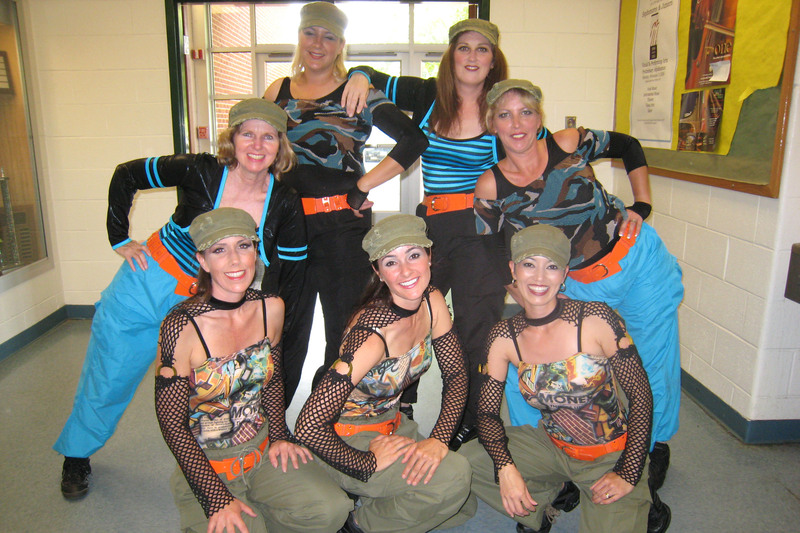 Anyway, my point is, this group of ladies I met through dance class were a huge support group when I was going through my cancer treatments. They were some of the very few people who actually saw me in all my bald glory as it’s very hard to dance wearing a wig and a hat usually got in the way. 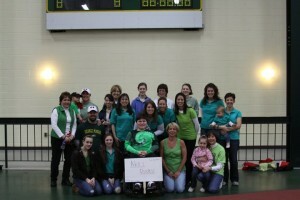 One of my dance lady friends, as I refer to them with my hubby, has a teenage son with Muscular Dystrophy. I have learned bits and pieces about his condition throughout the years but my friend, Leslie, comes across as a very strong, independent woman, so you would never know the physical and, more importantly, emotional strain it has put on her. I have always supported her MDA Walk efforts every year she has asked for donations, but this year I wanted to do more and decided to walk on her team with her. The team name is Nick’s Chicks. How cute is that? Nick is her son in the center. If you look closely there is one guy on the team. He works with the special needs kids at Nick’s high school. So we were trying to figure out if we should change the name for the day to Nick’s Chicks and….Chucks? Anyway, what an experience this walk was. Physically, it was nothing like the Avon Walk, which is the only thing I can compare it to. But emotionally I thought it was harder. Most of the people there with MD were just kids. It really pulled on the heart strings and it took everything I had to hold in any sad emotions. But what a great, fulfilling way to start my Saturday morning, doing something that hopefully will one day make a difference to everyone touched by this disease. And on a lighter note, let me tell you, these kids could whiz around in their wheelchairs! I think us walkers were going too slow for them because they kept zipping by us! Thanks Leslie and Nick for letting me be a part of a powerful experience. There are over 42 neuromuscular diseases that the Muscular Dystrophy Association supports, including ALS and other related diseases. The most common type of MD is Duchenne Muscular Dystrophy, usually diagnosed in early childhood, and causes a slow and steady decline of all voluntary muscles, the heart and breathing muscles. Duchenne Muscular Dystrophy primarily only affects boys, who inherit it from their mothers. Women can be carriers of the disease but show no symptoms. If you are a carrier of Duchenne MD, there is a 50% chance your son will have the disease or that your daughter is a carrier. As a child, my friend’s son, Nick, ran and played sports like any of our own healthy children. Now, at 15, he is in a wheelchair, dependent on others and is slowly losing the use of his arms.